How Far is Venkatesh Sharvil? Land is like a canvas for a creative construction corn pany. Venkatesh Sharvil is our creation with unusual colours that corn pliment to life. Venkatesh Sharvil, located at green serene Dhayari is collection of beautiful Two and Three bedroom homes standing on green backdrop. Location is highly appreciated by both home seekers and prudent investors. The area is fast-developing area in modern Pune. It is home to various leading educational institutes, industries and business establishments. More and more businessmen are investing in this area which reflects in proposed mall with seven multi plexes and - 1 00 feet D.P. road. Entertainment centres like Abhiruchi,Panshet dam,Khadakwasla dam,are in close vicinity. High class clubs, restaurants, fitness centres in this area offer a host of choices. Internls & External walls 6"/4" Concrete Bricks. Neeru Finished Internal Plaster for all Rooms. Decorative door frame having laminated shutters with quality fitting. Aluminum windows with mosquito net. Designer dodo up to 4'-0" dry terrace & 7'-O" for Toilets. 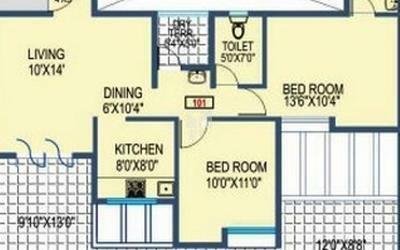 1O'-O" long For 2 BHK a 12'-0" for 3 BHK Granite platform with Nirali/Equivalent stainless steel sink.